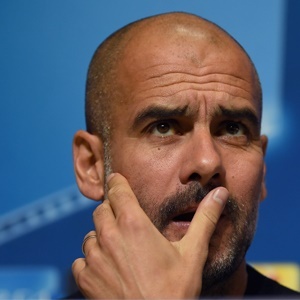 Manchester - Pep Guardiola says there is no chance that his Manchester City players will fall into the trap of over-confidence in their Champions League clash against Napoli despite their swaggering Premier League form. City demolished Stoke City 7-2 on Saturday to move two points clear at the top of the table and are attracting rave reviews for the quality of their attacking football, with 37 goals in 11 games in all competitions so far. But on Tuesday they face a stern test at home against free-scoring Serie A leaders Napoli, who have had an even better start to their league campaign with eight straight wins, compared to City's seven wins and one draw. Guardiola, speaking after the Stoke victory, said over-confidence would not be a problem for his side, who are top of Champions League Group F after wins against Feyenoord and Shakhtar Donetsk. "If they think (like) that they will be stupid," he said. "But that is not going to happen. "I am going to show to my players on Monday, Tuesday how good a game they (Napoli) are going to play. I will show them, like I showed them Shakhtar Donetsk, how good they are. "They are quite similar to Shakhtar in terms of the way they play but the difference is where Shakhtar maybe wait a little bit, they kill you with the high pressing. I am very happy to have the opportunity to play this kind of game." City, who ended last season empty-handed, have improved in all areas of the pitch, with their twinkle-toed attack allied to a stronger defence. However, centre-back John Stones said he was disappointed that City let in two goals against Stoke, despite their crushing win. "We conceded two goals, which is frustrating from my point of view," said Stones. "We will go away and work on that but I think it's been a great run of defensive play from all of us and I think we showed that. "As a back four and a 'keeper we have shown real progress and hopefully we can take it into the next game." Guardiola does not highlight defensive aspects, preferring instead to focus on the work of the team as a whole. "There is a tendency to split attacking and defending and in football you cannot," he said. "When you attack good you defend good, when you defend good you are going to attack good. "When you have the feeling to score goals you are going to defend better, when you defend better in the actions you are going to score more. It is not a coincidence. Everything depends on everything. "Football is dynamic - attack, defend, attack, defend in a row. That is why we have good statistics in those terms."